Benefit Estimates are a valuable tool to use when planning for retirement. Estimates are readily available through the online myMPERS Secure Member Access. You can run benefit estimates from the Estimate a Benefit screen. If you are actively employed, the estimate program assumes you will continue working in a benefit eligible position, and making your current salary, until the date of retirement indicated on your estimate. If you leave state employment prior to the date of retirement on your estimate, you stop accruing service. Therefore, your date of retirement and benefit estimate must be recalculated. It is important to understand that benefit estimates are just that – estimates. Every effort is made to assure the accuracy of the estimates; however, programming or reporting errors could occur without our knowledge. The information contained in the estimates must be verified before benefits can be paid. Use the 1st (or next) date eligible for retirement – The system determines your date of retirement based on your age, service, and the 2-Step Retirement Process deadlines. Enter specific date of retirement – Have a specific date in mind? This options is good for running a BackDROP estimate. Enter specific date of termination – Planning to leave state employment on a certain date? Enter your date of termination and the program will determine your date of retirement. Are you married? Enter your spouse’s date of birth and your estimate will include the Joint and Survivor benefit payment options. Want to know how the purchase of prior state service will affect your benefit amount? Enter the amount of prior service you might wish to purchase. 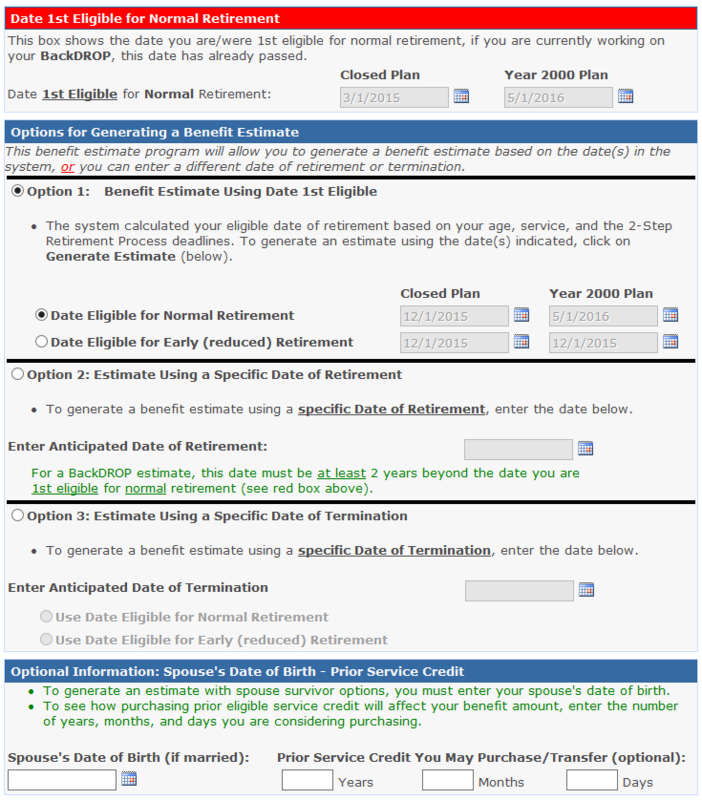 Below is an example of the Estimate a Benefit screen.